MEXICAN PAPER MONEY NEW EDITION! We are proud to release the 2017 Edition of the most complete guide to Mexican Paper Money ever published. 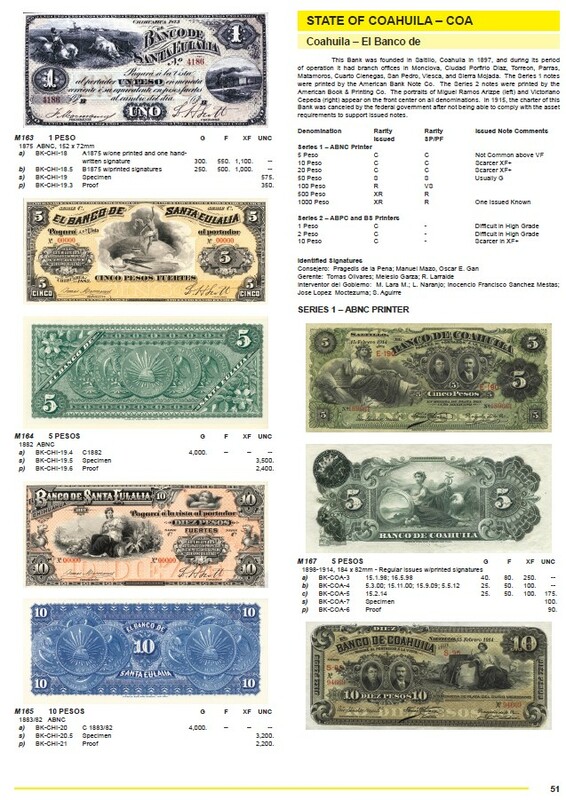 Mexican Paper Money has become the industry standard and contains listings on more than 7,000 items of which thousands are not listed in many catalogs. The 2017 Mexican Paper Money digital download should be used in conjunction with the latest version of Adobe Acrobat Reader, which can be downloaded free on the Adobe website get.adobe.com. This version of Mexican Paper Money is fully searchable using Adobe Reader. You can search for a specific word, an M number or anything else. The search window pops up when you open Adobe Reader. Further, the Table of Contents following this introduction section has links to the corresponding section in the book. For instance, you can click on Aguascalientes under Bancos and it will take you directly to that section. The 2010 hard cover edition consists of 400 pages printed in full color on over sized paper. We will ship it to you for FREE! Buy $700 or more of any currency in stock and receive a ten percent discount on the currency plus both editions of Mexican Paper Money at no extra charge. After completing your purchase contact the office for your download authorization. Mexican paper money has been well cataloged by a dozen authors over the past 50+ years, beginning with the works of Arlie Slabaugh and M. Ralph Brown in the 1950’s. The quality and usefulness of these studies has been consistently high, giving collectors a wealth of well-researched information. 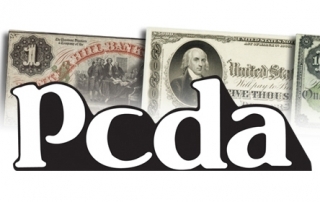 In his new 424-page Mexican Paper Money, Cory Frampton of the Mexican Coin Company has continued the tradition of excellence in the field and has taken it to a new level. While we see the word “encyclopedia” sometimes attached to lesser numismatic works, Mr. Frampton’s massive reference would certainly qualify for this title. It’s all here – Mexican banking history, histories of individual banks, grading of paper money, personages on bills, translations of terms, cross-references to former catalog numbers, rarity scales, and best of all, the main section cataloging every known bill, many never listed before. This main section of the book is broken down into six periods: Imperial & Early Republic, Banks, Pre Revolution, Revolution, Post Revolution, and Banco de Mexico. Each bill is catalogued with its major varieties in four conditions, and each bill is illustrated in beautiful color. Mr. Frampton did a massive amount of research for his book, investigating many sources that had not been tapped before. His hardbound classic will certainly be the standard reference in the field for many years to come. The early authors would have been very pleased to see the level to which our field has been taken by this beautiful work. Mexican Paper Money started out with modest aspirations. In 2006, editor Cory Frampton purchased the copyright to The Complete Encyclopedia of Mexican Paper Money with the idea of updating it. In the process, he and his editorial team went far beyond the original 1982 Krause publication: together, they have given us the most complete, lavishly illustrated work on this subject we are ever likely to see. Frampton chose his editorial staff with care, and it shows. Duane Douglas is one of the most knowledgeable scholars now working in the area of Mexican currency, and his shop in Mexico City and twice-yearly auctions have long served as a focal point for hobbyists and researchers alike. Alberto Hidalgo is another outstanding dealer in this material; both he and Duane were deeply involved in the preparation of The Complete Encyclopedia of Mexican Paper Money. 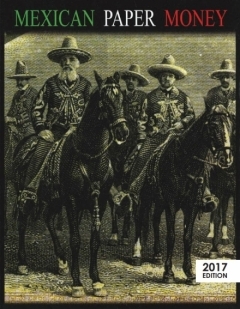 Texan Elmer Powell has put together the finest collection of Mexican Revolutionary currency, and many of his notes are illustrated through the course of this publication. The new book is intelligently laid out. It’s organized chronologically in six large sections (Imperial and early Republic; era of the private banks; pre-Revolutionary currency issued by entities other than banks; Revolutionary paper, including military, state, municipal, and private issues; emergency currency from the post-Revolutionary period; and early products of the Banco de Mexico, down to about 1970. Frampton employs two numbering systems – his own, wherein each note gets its own, whole number in sequence, preceded by an ‘M’ (for Mexico), and the numbering system devised for the 1982 publication. The latter poses organizational challenges, but many collectors have arranged their holdings in accordance with it; this new book allows its retention if desired. Some of the greatest value of the book will be found in its introductory sections. Frampton and his colleagues first offer basic information on grading, pricing and rarity. They follow with a cogent history of Mexican currency from the 1820s to the present, concluding with something I found really useful – a series of biographical sketches of all of the characters whose portraits have appeared on Mexican currency over the years. Each of the sections comprising this book has its own strengths. That devoted to the First and Second Empires illustrates rarely-seen notes – indeed, some of this material will not be found anywhere else. The section on private banks gives useful information about the foundation and eventual fate of each entity – along with gorgeous illustrations of their currency, proofs and circulating notes alike. The chapter on pre-Revolutionary, non-bank paper is extraordinary: I doubt whether you will have seen most of this material; I never had. But the prize for the sheer amount of new material has to go to the section on the Revolution, that chaotic period spanning the ten years between 1910 and 1920. Many of us are aware of some of the issues of the various contending armies and leaders of the period (indeed, Francisco Villa circulated so much currency that some of it eventually found employment as stage money in plays and Hollywood pictures). But I seriously doubt whether anyone will have seen more than a tiny fraction of the local, especially local private, issues that Frampton and his co-editors present. They opened up an entire new world for me, and I’ll hazard the guess that they will for you, too. I have one criticism, but it’s minor. 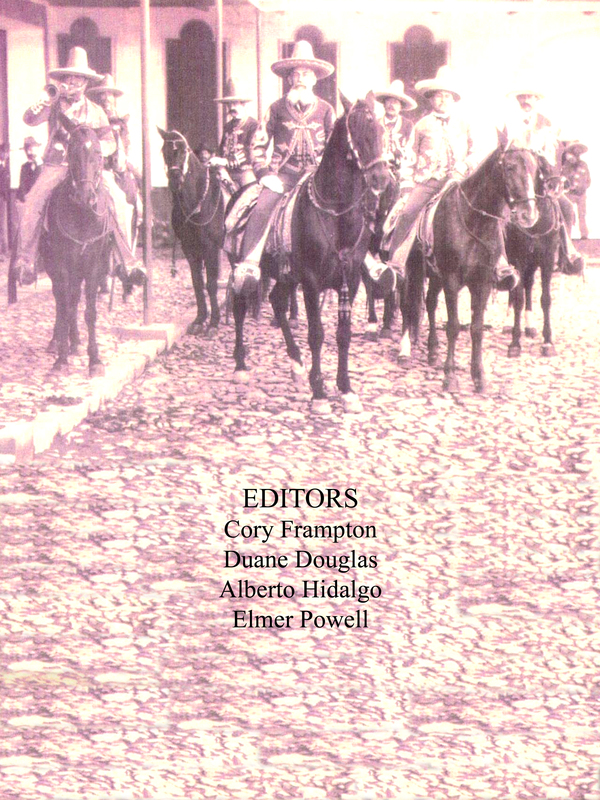 In the introduction, the editors explain that the modern issues of the Banco de Mexico are not covered in this book because Duane Douglas has his own, exhaustive publication including them in detail. That’s true (and contact information for those interested in acquiring the Douglas book is thoughtfully provided). But the failure to say something about the very types of notes the beginning collector is most likely to encounter was somewhat jarring, at least to me. Nonetheless, considering the wealth of coverage of every other aspect of a major country’s history and currency, this minor omission is just that, minor. This is an epochal book, and I most highly recommend it.